With three well positioned offices within the Kingston Borough, Greenfield offers a comprehensive range of property services. Our staff members know the local market better than anyone and have unrivalled knowledge and expertise to ensure they are dedicated to giving you the best service. 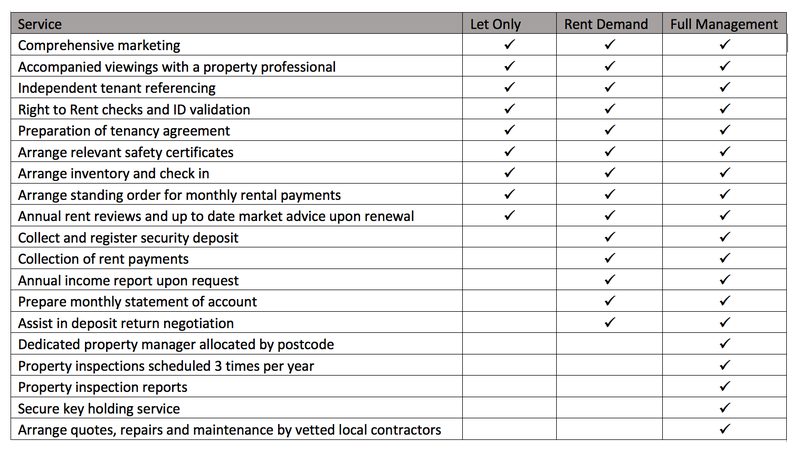 We offer a full range of packages to suit all requirements, circumstances and type of property. Whether you are looking for an agent to purely find you a tenant or to look after your investment as if it were our own, we have a service to match your needs. We take the time to get to know your requirements to enable us to maximise your investment potential. Understanding your reasons for letting your property, your future plans and ideal timescales will assist us in finding the right person for your property. You never get a second chance to make a first impression – the same goes for your property. Our experienced staff will advise you on how to prepare your property for marketing, to obtain the maximum rental potential. Once you are ready to present your property to the market, we will advertise on popular property portals including Rightmove, Zoopla , On the Market and Prime Location and our proactive staff will actively promote your property. We will ensure you receive regular feedback and progress updates from one point of contact, so that the letting process is as smooth and hassle free as possible. We carry out full tenants checks using an independent referencing company, offering unbiased reports and full transparency. With legislation changing year on year, you can be safe in the knowledge that Greenfield are fully compliant and will carry out all Right to Rent checks and ID validation checks prior to a tenancy commencing or being renewed. You can rest assured as a member of The Property Ombudsman (TPO) for Lettings we subscribe to TPO’s Codes of Practice. Being an independent agent, we rely on word of mouth and positive experience reviews from our clients – our emphasis is always on customer service. It is essential for us to have an excellent reputation and this can only come from delivering exceptional customer service. The majority of our business comes from recommendations and repeat business, building a long term relationship with our customers is of the utmost importance to us all here at Greenfield. If you are considering letting your property in the near future and would like some honest, friendly advice from a local specialist then please do give us a call, we would love to meet you. Please contact either Joanna on 020 8399 7070 or Elizabeth on 020 8942 0900 to discuss how we can tailor make a package to suit you. You will often see us giving back to the local community and actively taking part in local events. If you would like to discuss sponsorship opportunities then give us a call, we would be delighted to find out how we can be of assistance.